Decorating a dining space can be a challenge. Whether it is an office canteen, a café or a bistro, dining areas are places where people come to relax, work, or socialise. Therefore, it is important to choose inviting, cosy and comfortable furniture. 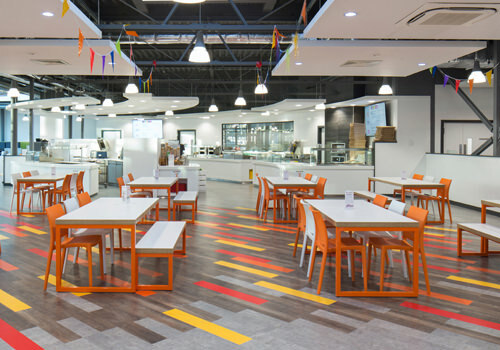 We offer a wide range of commercial catering furniture suitable for every need and space. Our range includes indoor and outdoor café furniture, stackable and multipurpose canteen furniture, soft seating, stools and benches available in a number of different colours and styles. 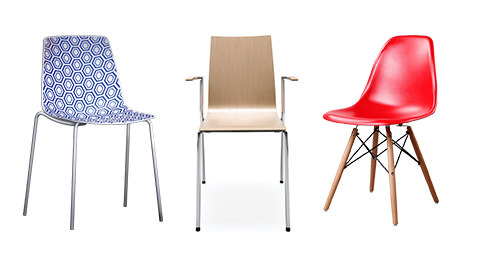 At Radius Office Furniture we have everything from wooden tables to colourful metal chairs. Whether you want some industrial café furniture or a sleek Scandinavian design for your bistro, we represent brands that cater to your needs! When choosing hospitality furniture you need to create a good first impression with a design that stands out of the crowd, but also ensure that your customers enjoy the comfort that will make them come back time and time again. Originality, quality and comfort are three central characteristics of our Café Furniture range. And if you can’t make up your mind, contact Radius Office Furniture to have a chat about how to choose the best café design for your space! A dining area is more than just a place where people come to eat. Whether it is a coffee shop, a restaurant, a bistro or an office canteen, these places are hubs where people socialise, work or just take a break and relax. When buying café furniture it is important to have a concept in mind. Big tables and dim lighting encourage socialising and relaxation. Individual tables and bright lights encourage independent work and productivity. Do you dream of a classy coffee shop design where people can take a break from their daily lives and disconnect? Our café furniture suppliers combine soft and hard textures, like birch tables and soft seating for a warm and comfortable interior. Do you want to create an office canteen where your employees can stay alert, or even work? 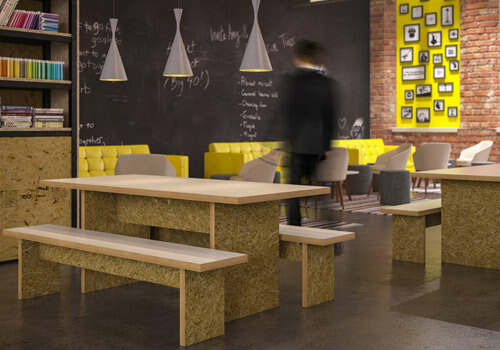 Take a look at our wooden café furniture to achieve a sleek Scandinavian design that combines productivity and comfort. You can choose either monochrome wooden seats and tables or colourful bench sets with soft seating, according to your needs and vision. Their impact resistant edges and easy to clean surfaces make them perfect for the hustle and bustle of a busy canteen environment. If you’re looking for some retro yet modern bistro sets, you can mix white furniture with a splash of colour, like our translucent chairs or colourful canteen stools. This combination will give your space a retro design while enjoying the practical benefits of modern furniture. Colour is an important factor. If the concept you have in mind is the cosy, intimate space of a coffee shop, choose dark, wooden furniture like oak or walnut. The colour and bulk of the furniture will give your café a vintage, intimate vibe. If you want an open and inviting space where people can be creative, use bright colours. White or neutral dining tables reflect the light better, making the most out of an open space. 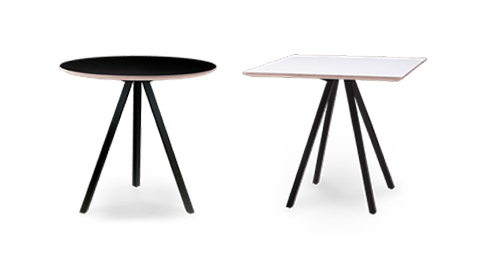 Combine our glass tables or white tables with our stackable canteen chairs or high bar stools for a modern look and an inviting, practical space where people can do work or discuss business. If you have a small space, don’t go for bulky oak tables and dark colours. Instead, choose tables, stools and chairs in bright colours to create the illusion of a bright and open environment. They also come in different shapes and sizes and are easy to adapt to the requirements of a small space. You can also try stackable or multipurpose furniture that can be easily stored or repurposed to make the most out of a small space – also available in different colours and sizes. Don’t forget about durability! When buying Café Furniture it is important to make long-term investments and choose materials that can stand the test of time. Wood and metal are a great choice and can be adapted for a variety of styles and spaces. Fortunately, at Radius Office Furniture you can opt for quality without breaking the bank! Radius Office Furniture offers a diverse range of products for prices that fit every budget. And if you feel overwhelmed by all the choices, do not hesitate to contact us! We can assist you with space planning and help you buy the furniture that suits your needs to ensure that you make the best out of your bistro, coffee shop or canteen. If you’d like to find out more about our range of Café Furniture or discuss your requirements, simply request a callback.